Allen, Robert S.. "Port-Royal National Historic Site". The Canadian Encyclopedia, 17 January 2018, Historica Canada. https://www.thecanadianencyclopedia.ca/en/article/port-royal. Accessed 25 April 2019. 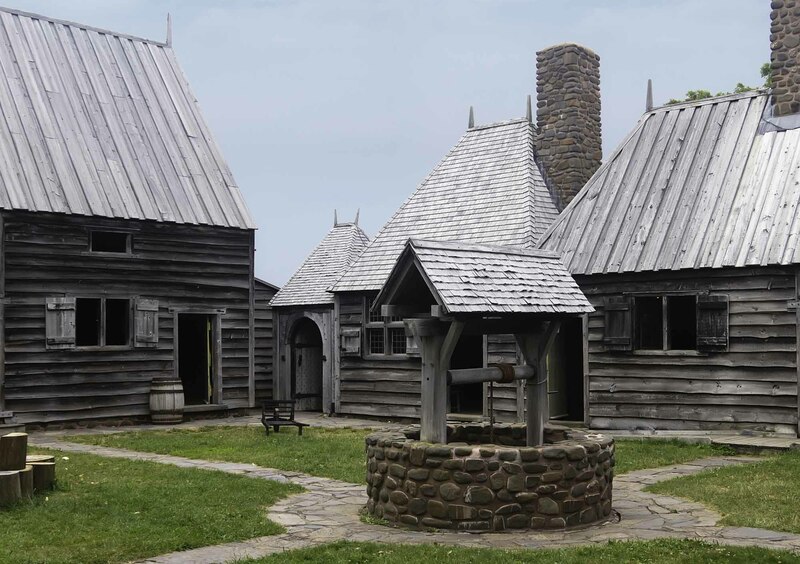 Located in Nova Scotia, Port-Royal National Historic Site features a reconstruction of the Port-Royal Habitation, one of the first settlements attempted by the French in North America (1605). 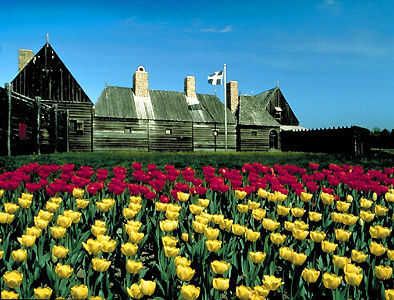 Administered by Parks Canada, this historic site offers interpretive activities that convey the French settlers’ challenges in implementing the new colony. Visitors can also learn about the culture of the Mi’kmaq, the area’s first inhabitants of the land. Reconstruction of the original French settlement Port Royal, near Annapolis Royal, Nova Scotia. 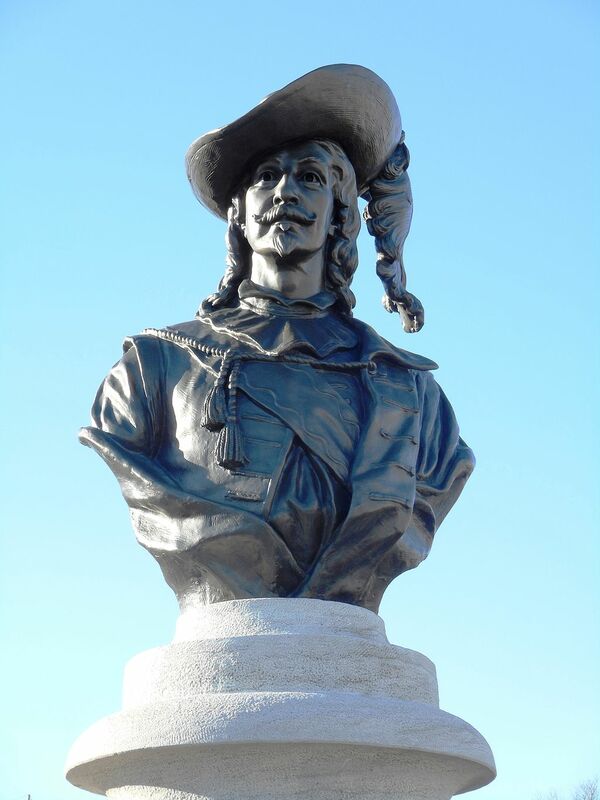 Port-Royal (near Annapolis Royal, Nova Scotia) was established in the summer of 1605 on the north shore of the Annapolis Basin near the mouth of the Annapolis River by a French colonizing expedition led by Pierre Dugua de Monts and Samuel de Champlain. De Monts hoped that the site would prove more congenial than the St. Croix River where his men had spent a disastrous winter in 1604-05 (see Ile Ste. Croix: The Birth of Acadia). The Habitation consisted of buildings grouped around a central courtyard. 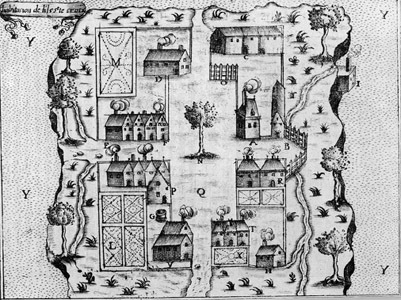 The garden became the first European experimental seed plot in North America. 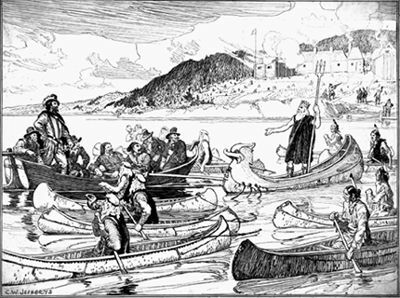 During the winter of 1606–07 Champlain organized the Ordre de Bon Temps, the first social club in North America, and it was here that the first theatre event in Canadian history took place in 1606, Marc Lescarbot’s Le Théâtre de Neptune. Hopes for a prosperous colony were disappointed, however, and the site was abandoned in the summer of 1607. First play in Canada, 1606, imaginary reconstruction by C.W. Jeffreys, pen and black ink over pencil on cardboard. 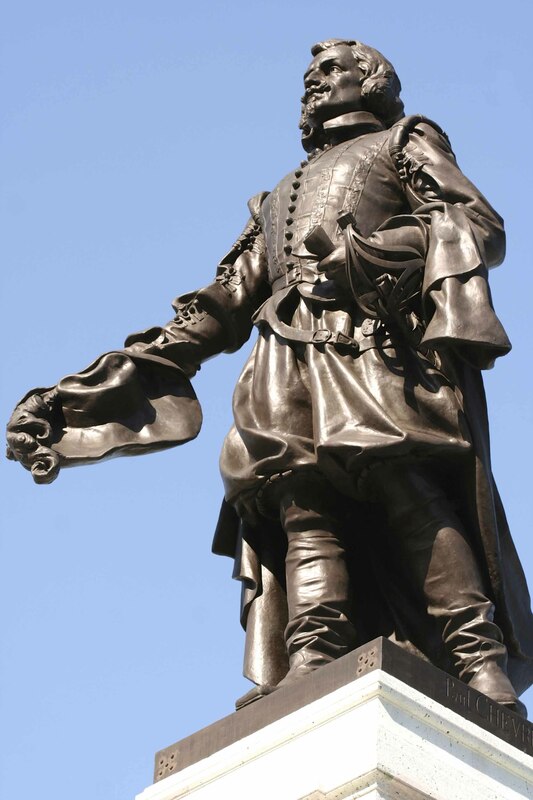 The colony was re-established in 1610 by one of the original colonists, Jean de Biencourt de Poutrincourt, but the Habitation was destroyed three years later by English freebooter Samuel Argall. In 1629, Sir William Alexander, eldest son of Sir William Alexander, Earl of Stirling, established a Scottish colony there, but in 1632, following the Treaty of Saint-Germain, the French repossessed the area. Although the buildings were rudimentary, Port-Royal remained the earliest European settlement of any permanence in North America north of St. Augustine, Florida. The first dikes were built on the marshes before mid-17th century, and the concentration of troops and administration around the fort made for the only compact village in Acadia (see History of Acadia). The farmers lived in relative poverty, compared to elsewhere in Acadia, though they developed small orchards and were able to provide cattle, sheep and wheat for export to the fortress of Louisbourg. When retaken by the English in 1654, Port-Royal had a population of about 200; at the time of the Conquest (1759–60) it was about 350. In 1923, Port-Royal was designated as a national historic site. In 1939, the federal government reconstructed the Habitation and in 1941 opened to public the Port-Royal National Historic Site. Éric Thierry, La France de Henri IV en Amérique du Nord. De la création de l'Acadie à la fondation de Québec (2008). Kespitutik to Port RoyalExplore the living history of Nova Scotia's Western Valley.